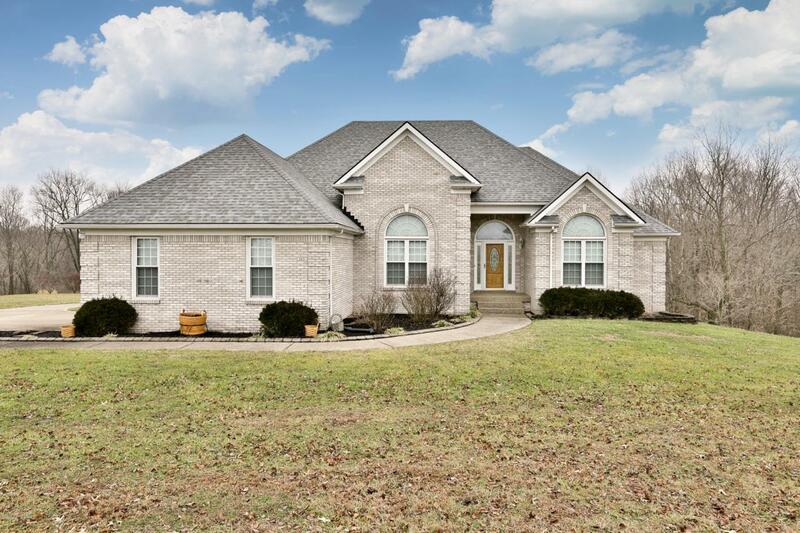 Great location on a quiet 5.61 acre partially wooded lot yet a convenient drive to town, I-64, Frankfort, and Louisville. Extremely well built and perfectly tended home with lots of room to spread out and featuring all the ''bells and whistles.'' Upon entering the attractive foyer, the first floor features a great room with brand new carpet, gas fireplace and tray ceiling, formal dining room, kitchen with handsome cabinets and all appliances, breakfast room with bay window, and laundry room. Two large bedrooms offering an abundance of natural light and a full bathroom in addition to the master suite complete the main level. The master suite is complete with a private sitting area, huge walk in closet, and double vanity. A large family room, bedroom, and additionalfull bathroom complete the finished portion of the basement. In addition to the 2 car garage on the main level, the huge concrete driveway extending to the lower level garage allows for plenty of space for parking and entertaining. A large screened in covered porch situated off the main living area offers private views of the backyard and above ground pool. The 40 x 20 barn plus 40 x 12 shed located toward the woods has a concrete floor and is complete with full electric and water. Listing provided courtesy of Torrey Smith Realty Co., Llc. © 2019 Metro Search, Inc. All rights reserved.